It was last October, Halloween actually. We were in Paris for one night on a layover after a trip through Spain’s Catalonia region. Being our last night of the trip, my girlfriend and I decided to check out a bit of the nightlife after dinner. After dinner we head to Kong. My girlfriend had been there the year before and gave it a thumbs up. We arrived fairly late and got in no problem. It was decently crowded with a fantastic DJ playing just the sort of Euro-style dance music you’d expect. We were sitting at the bar when a group walked in. I happened to glance and did a double-take, “Hey, that guy looks familiar.” My girlfriend looked but didn’t say anything. “He knew we’d be here,” I joke. Ha. Immediately he hits the dance floor. It was no crazy game of fetch either; the dude can bust a move. As if this story needed more, something funny happens. Some random dude walks right up to Monfils, the crowd parts, and he challenges Gael to a dance-off by doing some serious acrobatic spins and bounces. He even through in a mimicked service motion to point out he knew who he was dealing with. Being a professional tennis player Gael is not one to avoid competition. He met the challenge and did his own little signature routine of moves. I didn’t know what to make of what I was seeing. Is this just what happens in Paris? As for who won the dance off? Undetermined. It was a good-natured exchange and fun for all to watch. 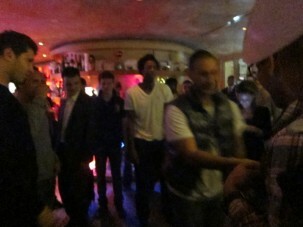 But did I mention Mr. Monfils is a great dancer? His footwork was spectacular (and dancing is one of the top 10 fitness fads for tennis players). For some reason, all the girls seemed to gravitate to him. They would come dance with him and then when he got tired of it, he’d call in his posse who would then surround the girl and bump her around like a pinball as Gael slid away. 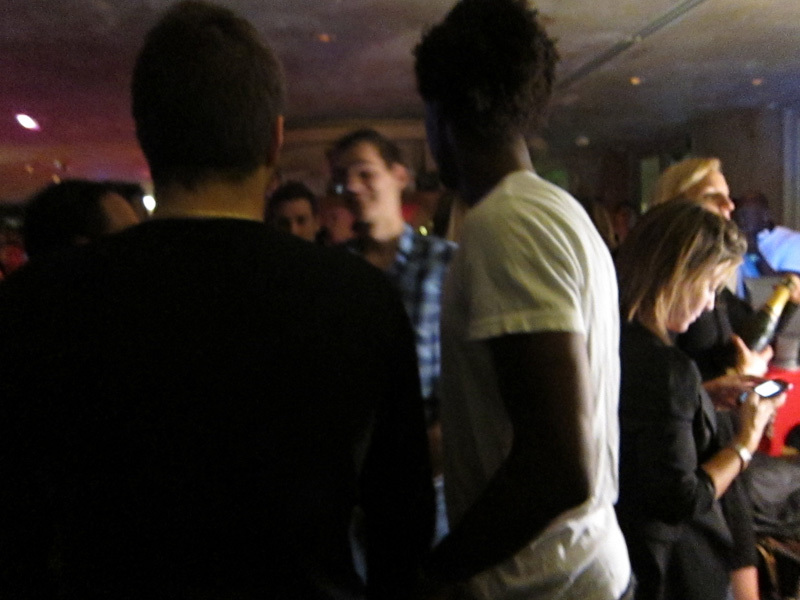 Here’s a very grainy and ultimately anti-climactic video when Gael happened NOT to be dancing at the club. I didn’t get very good footage or photos as I tried to remain discreet. Why was he there on this night? Our guess was that Gael was out celebrating his ATP tournament win over Ljubicic at the Open de Sud in Montpelier, France. And why not? What better way to celebrate. 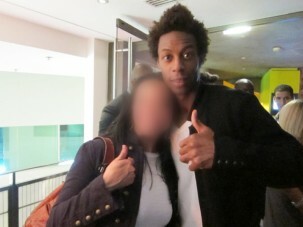 We happened to leave at the same time and, sure enough, Gael was glad to snap photos with us as seen above. He was super friendly and cool about it. What a night!